I first met Ken Yalden a few years ago. Ken is a keen member of the International Guild of Knot Tyers. As we chatted he recalled I had mentioned a prick of tobacco in KYDD. Recently Ken sent me a fascinating little monograph from the Museum of Knots & Sailors’ Ropework that he’s written on the method used by sailors for making a ‘navy plug’ of tobacco. Although modern sailors no longer practice this, it was well known in Kydd’s day – and with Ken’s permission I’ve extracted material from the monograph for this blog. As with many things at sea, ‘navy plug’ has more than one name. The common name amongst sailors was ‘prick of tobacco,’ echoed by the French with the use of the word carrotte. Other names were cut plug, and plug tobacco. The word plug might stem from its shape, which resembles a tapered wooden plug used in a barrel or a bung in the bottom of a boat. The name ‘perique’ comes from the strong ﬂavoured dark tobacco grown in Louisiana; attributed to the Frenchman who ﬁrst planted it. 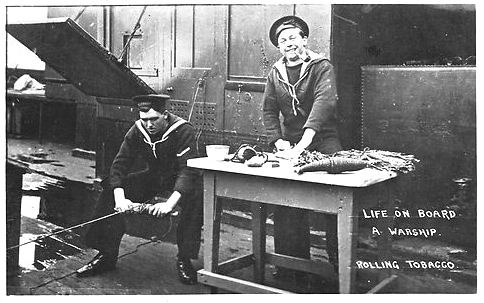 Aboard ship smoking was only permitted at set times, usually outside the formal working day. The monthly issue of tobacco to sailors was in dried leaf form, supplied in ‘hands,’ shipped in dry casks. A hand consisted of a bunch of loose leaves gathered by the stems and weighed on issue. The hand of tobacco was spread out on a ﬂat surface and the stalks and large veins removed. 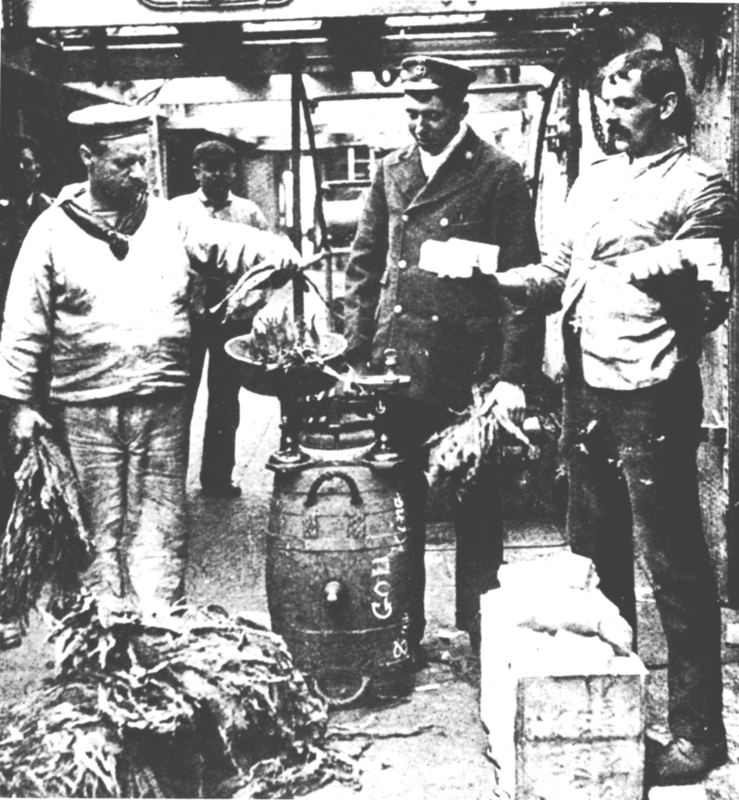 The stalks were handed back to the Victualling Office for return to the tobacco purveyor, to be ground into snuff. The leaves were then placed onto a rectangle of cloth, commonly cotton duck. As the leaves were laid out they were sprinkled with a mixture of water and rum, then laid to overlap so that the pile in the centre was higher than those at the two sides, giving a tapered shape. The cloth was then rolled tightly by hand to make a tube, then marline hitched, much the same way as a hammock, giving it the appearance of a cigar. Compression was brought to bear by applying a serving to the outside of the prepared tube. This was definitely a two-man job. Tobacco was officially supplied for use of ships’ companies in the Royal Navy from January 1799. Previously, it was sold by the purser, on a private basis, and the cost deducted from seamen’s wages. Although Kydd’s father had smoked a long church-warden pipe he himself had never taken up the habit. Renzi, however, did enjoy a pipe, especially on the foc’sle during dog-watches – and in KYDD, chapter 10, Tom Kydd presents Renzi with a gift of fragrant whorls of tobacco from a perique he had made; he’d learned the process from one of the gunner’s mates with whom he’d shared a watch. While the “tar” flavour of the Plug may be absent, It is still posible to sample this particular type of tobacco preparation in the form of a Danish brand called “Escudo Navy De Luxe”. its a little strong for daily use. (IMHO) however, when sailing, its strength shows its merits in a high breeze. It comes in a tin with thin slices off the ‘plug’ already done, ready to put in a pipe. Tickler, made Jam Preserve during WW1, the jam came in tins, just handy to put cigarette tobacco in. On board HMCS Sackville , in our display case we have a plug of hemp wound tobacco. This tobacco was enhanced by the occasional dollop of pussers rum by one of our wartime sailors. Might be a bit untasty at this time. Most of the time when reading, I’m visualizing the story. I have spent a great deal of time in reference books (many of your recommendations) just to add to my mental catalog. This is one of those details that will add another layer of richness to the stories. Thanks! Later replaced by monthly duty free issues of tins of ‘tickler’, blue liners (cigarettes), or shag, a compressed pipe tobacco that had a very pleasant rum smell to it. We were issued with 3 tobacco stamps, which were either traded on the black market or used to buy the issue. When I joined in 1968, they cost about a shilling a hundred, each stamp allowed the purchase of 100 cigarettes, or 4oz tobacco. The cigarettes were made by Gallagher. When afloat, 6 stamps were issued and civvy cigarettes and tobacco was bought at DF prices.